In the framework of BEEHIVE project kick-off meeting hosted by Varna University of Management, the project coordinating institution, a press conference for the local media was held at the institution’s premises on 17th February 2017. 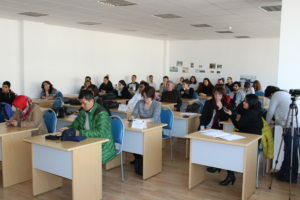 Journalists from the local newspapers and radio stations, as well as regional representatives of the largest national newspapers and news agencies attended the press conference. Christina Armutlieva, BEEHIVE project manager was joined by Dr Nining Soesilo from University of Indonesia, Ms Debby Sonita Lubis from University of Bina Nusantara in Jakarta as well as by Dr Delia B. Senoro from Mapua Institute of Technology and Dr. Richel Lamadrid from Saint Louis University in the Philippines. The project team members presented the Erasmus+ CBHE programme’s main priorities and scope of action, the BEEHIVE project chief objectives, milestones and activities and the structure of the consortium.